The Syrian opposition on Friday welcomed U.S. strikes against a Syrian government airbase and called for more after two American warships fired dozens of missiles at the airfield in a sharp escalation of the U.S. military role in Syria. The Syrian opposition has long been critical of U.S. policy towards the Syrian conflict, saying former President Barack Obama’s administration had failed to give enough support to rebels fighting the better-armed Syrian army and its allies. “We hope for the continuation of the strikes in order to prevent the regime from using its planes to launch any new air raids or going back to using internationally banned weapons,” said Ahmad Ramadan, head of the media office of the Syrian National Coalition political opposition group. Hasan Ali, commander of the Free Idlib Army rebel group, which fights under the Free Syrian Army (FSA) umbrella, told Reuters the strikes came at a “very important phase” and showed Syrians that “there is still humanity in this world”. While Ali said he did not expect more strikes, “we can say that the time has become very appropriate for Bashar al-Assad and the criminals with him to go to the dustbins of history”. Nasr al-Hariri, chief negotiator of the High Negotiations Committee (HNC), said on Twitter that the strikes “in case they continue, would kick off a correct start in combating terrorism”. The Saudi-based HNC, the main opposition body which includes political and armed groups, has participated in U.N.-sponsored peace talks in Geneva. 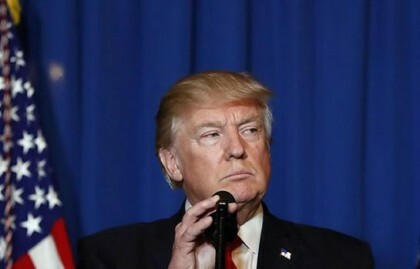 U.S. President Donald Trump said he had ordered missile strikes against the airfield from which a deadly chemical attack was launched, declaring he acted in America’s “national security interest” against Syrian President Bashar al-Assad. The strikes drew sharp criticism from Russia, Assad’s ally. U.S. officials said the military fired dozens of cruise missiles against the base in response to the suspected gas attack in a rebel-held area this week, which Washington has blamed on Assad’s forces. The Syrian government has strongly denied responsibility and says it does not use chemical weapons. “The airbase targeted by the U.S. strike was used to kill Syrians,” Ramadan said. The U.S. attack “sends a clear message to the regime and its backers” that they can no longer avoid repercussions, Ramadan said. The governor of Homs province said earlier that the airbase was used to support Syrian army operations against Islamic State.